In a game that followed a similar trend to their first meeting of the season, the Eagles jumped out to a big lead and then held on in the 4th quarter, as the Redskins tried to come back from a 24-point deficit, only to fall short with less than a minute left, 24-16. 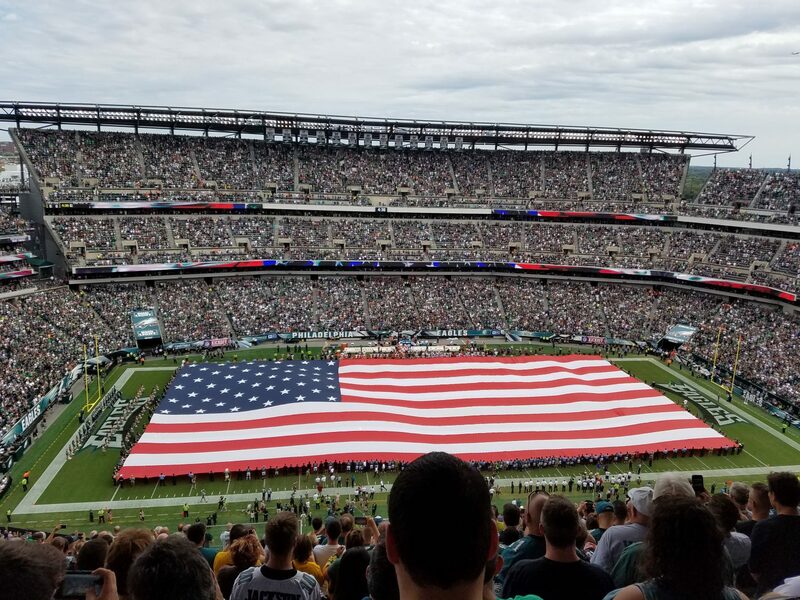 At the start of the 4th quarter, Birds fans, having sung their team’s fight song three times during the game (to match their three touchdowns), were content with the knowledge that the Eagles would finally break their 10-game losing streak at home with a convincing win that would be over long before the final gun sounded. And then, just like that, the Redskins, fresh off two unanswered touchdowns, were driving for the tying score with the faithful suddenly on pins and needles with Washington at the Eagles 18-yd line with less than a minute left. But this time, heartbreak and an 11th straight loss at home would be avoided thanks to Brandon Boykin’s interception in the end zone, made possible by defensive tackle Fletcher Cox’s pressure on Robert Griffin, forcing him into a feeble attempt to throw the ball away. With the victory, the Eagles find themselves at 6-5 and in the lead in the NFC East heading into their bye week. And for the 1st time in three years, they will head into the final month of the season with the knowledge that they will be playing meaningful games in the month of December. Sure, we all know that the Eagles lead what is a weak field in the NFC East and haven’t beaten anyone that would be considered a quality team. And even if they earn a division championship and a possible 1st round playoff victory, the Birds will probably become roadkill for the Seahawks or the Saints at some point. But after the last two years of mediocre to just plain awful football, does it really matter? Making the playoffs in Chip Kelly’s first year, even if it does result in a 2nd round exit, would surpass the expectations of most. And fans would be content going into the offseason that they have a team on the “up and up”, a legitimate NFL coach who has made great strides in his first year, and a smart and accurate quarterback in the humble Nick Foles. It also doesn’t hurt that the defense is actually looking better than we thought they were. This week is the Eagles bye week, which also happens to be the last week for byes in the NFL season. And with only two marquee matchups on the docket this weekend, and none in the early games, this Sunday is a fruitful one for picking up that Thanksgiving turkey and all the trimmings (or heading out in the woods for some turkey hunting if you’re the rugged outdoorsy type). And while the Cowboys-Giants matchup is not a marquee game in my opinion, there should be no doubt that those of us that are Eagles fans need to root for the G-Men to defeat the Cowgirls. Colts at Cardinals 4:05 PM CBS – The surprising Cardinals are 6-4 and playing well under former Colts assistant coach (and former Temple coach) Bruce Arians. Broncos at Patriots 8:30 PM NBC – Manning vs. Brady again….’nuff said.